A dull and dreary day to work with for our Miss St Helena photoshoot. 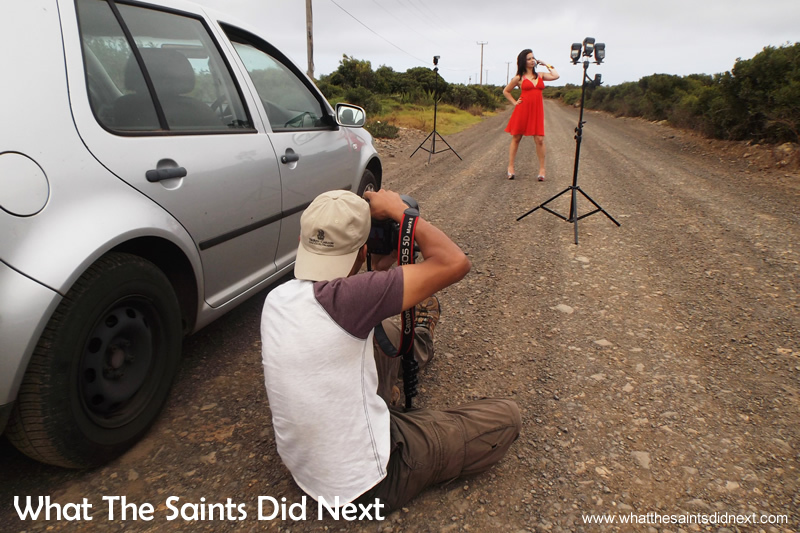 Nothing stops traffic like a pretty girl in a red dress on the side of a road; in this case 40 tonne lorries and a Miss St Helena photoshoot with Sinead Green. We didn’t quite delay the new airport project, but the sound of downshifting from the construction plant on the adjacent road certainly suggested their usual, beaver-like, earth shifting pattern was being disrupted. It was mid December; normally a sunny month on St Helena. We’d planned this outdoor ‘Breeze’ e-magazine photo shoot a month earlier, yet unseasonal rain nearly ruined it. Grey and drizzly on shoot day, it wasn’t looking good. An alternate indoor venue was hastily arranged, which thankfully, in the end, wasn’t needed. It was a Thursday. Sinead was on time, 12.30pm at our house, with a mountain of clothes, shoes, scarves, jewellery and other colour coordinated accessories. Sorting out the styling with plenty to choose from. 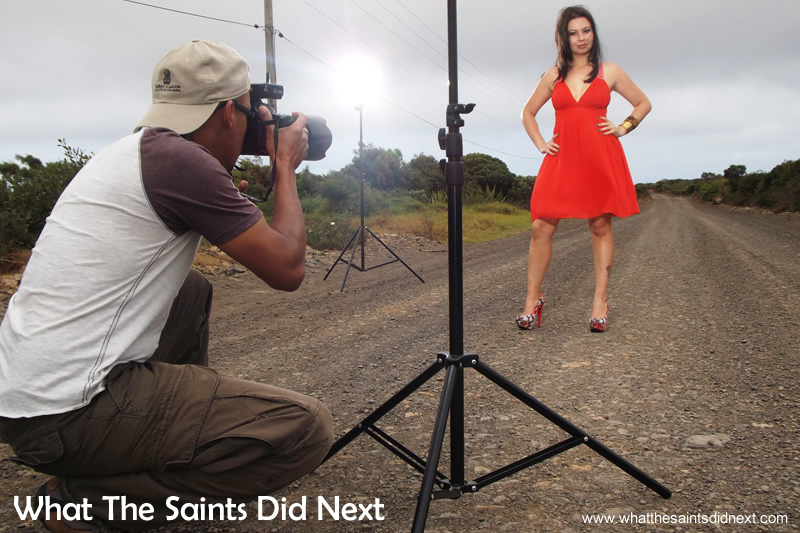 Miss St Helena photoshoot with Sinead Green. A relieved model, now that makeup is being applied. 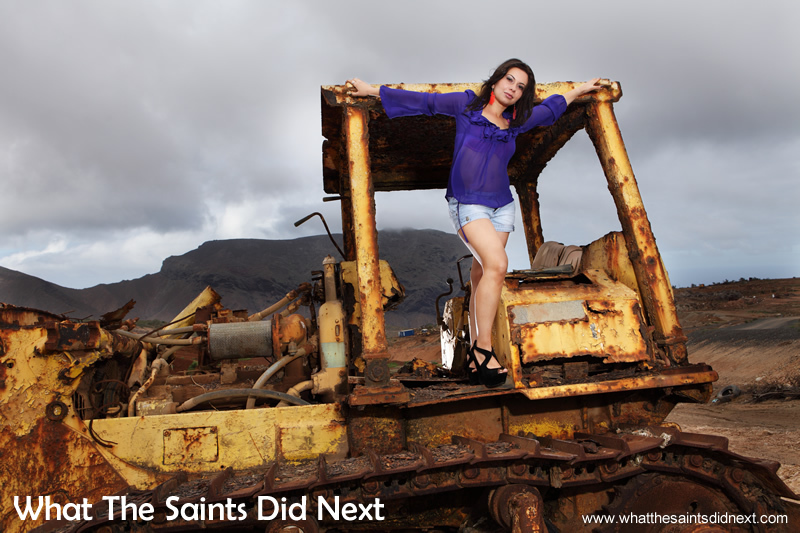 Miss St Helena photoshoot with Sinead Green. Outfits selected it was then time for makeup, much to the relief of Sinead, who hated the instruction that she arrive without anything on her face whatsoever. “I have to tell you, I look some scary without makeup,” she had warned. 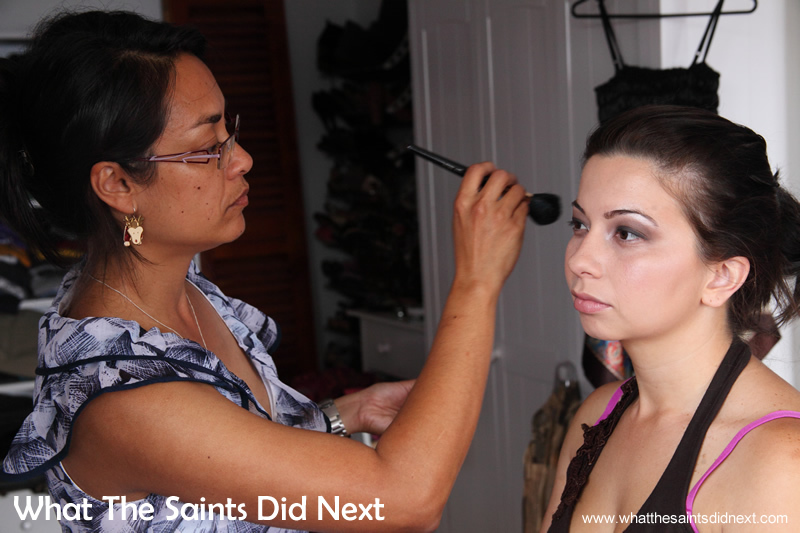 Sharon is a fully qualified makeup artist and set to work with the brushes. An hour later the model’s face and first outfit were ‘on’ and we were off! Shoot location was 10 mins drive from the house; the Millennium Forest area, overlooking Prosperous Bay Plain where the airport was being built. We decided to use the side road to shoot the first look. In fact, the actual first look was rather comical. Sinead had been issued chunky walking boots for mobility between sets on the uneven terrain. Cocktail dress with walking boots – oh, the behind the scenes realities of a glamorous modelling shoot! A retouched first look shot. 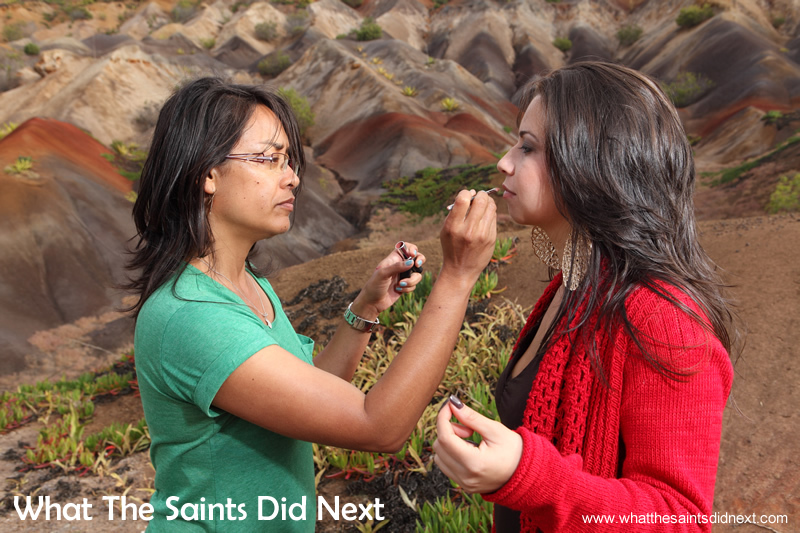 Miss St Helena photoshoot with Sinead Green. We were set up adjacent to the main road leading to the airport site, not expecting much traffic. But we hadn’t anticipated the affect on the lorry drivers. The three of us had a good laugh as the vehicles slowed to a crawl, then sped up after they had gotten a good look. The thick clouds could work in our favour, creating a natural moody backdrop. It was all about getting the balance of light right. Technical data (for togs): Lighting used were four flash units, also known as speed lights or strobes: a Canon 580EXII and three Yongnuo YN560IIIs. Three strobes were clustered on a single light stand fired by a Bowens Pulsar radio trigger connected to the master Canon unit. Stofen diffusers were fitted and each strobe’s power set to 1/2. The Yongnuos triggered as slaves. Although overcast it was necessary to group the strobes to effectively create one large flash, enough to counter the natural light. The fourth strobe was bare (no diffuser), positioned on a second stand behind the model to deliver some hair light. Using the monopod for stability with the longer lens. 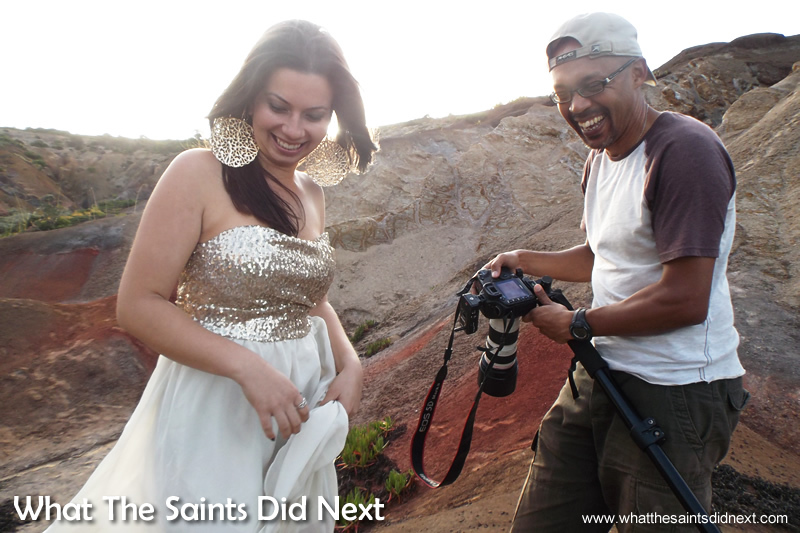 Miss St Helena photoshoot with Sinead Green. Most shots relied on the 70-200mm Canon telephoto lens; just a few images captured using the wider 24-70mm lens. I used a monopod with the telephoto lens, for extra stability. And of course, camera, the reliable Canon 5D MKII. With the first look wrapped, the car then became a changing room. Couldn’t risk causing an accident on the other road! We moved 200m further on into the Horse Point landfill site, and found a rusted old bulldozer, abandoned on a gentle slope. Perfect for our second set. Tropical island or not, when it’s overcast and there’s a chilly breeze blowing, it can be cold. Sinead’s sheer fabric top and shorts were not so great for warmth. It didn’t help that we perched her high up on the bulldozer, and then spent 10 mins setting up equipment. A shivering model is not a quiet model! The bulldozer shots were harder than they looked because of the sloping ground which meant holding on to the light stands. Moving between the different poses was a delicate operation on the rusty old machinery. Thankfully the pictures were worth the discomfort. The old yellow dozer, covered in reddy brown rust, was a super prop. The sloping surface and breeze meant we had to be extra careful with the top heavy light stands. We were out of view from the lorry drivers now, but we did attract one ‘curious’ onlooker who diverted from his (or her) trip to the landfill and parked nearby to observe. The intrigue of an outdoor shoot. For our third look, despite cloud cover, we decided to head down into the Painter’s Palette, a little valley full of amazing coloured earth marls. We were due some luck with the sun. Sinead was on her third outfit, a long red cardigan with shorts and a vest, and the hiking boots were back as we picked our way down into the valley. 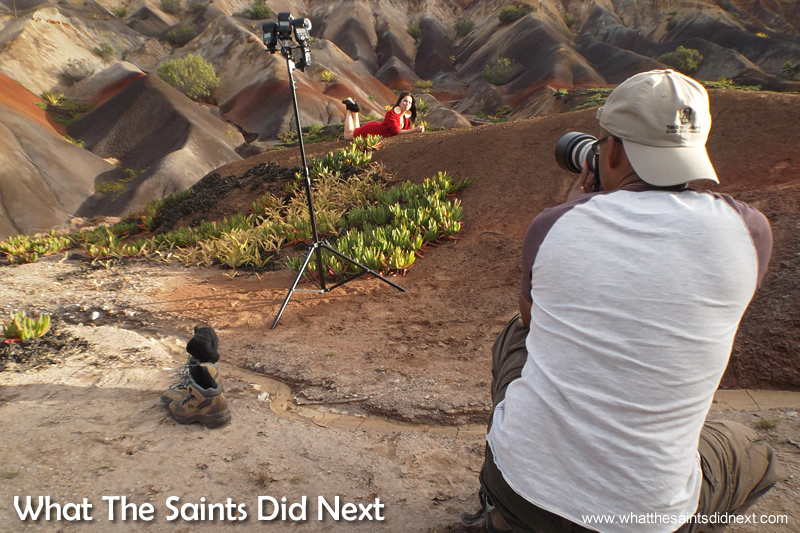 After changing into high heeled boots, which kept sinking into the soft dirt, we got busy with the shoot. Right on cue, the clouds parted (just a little bit) and that blessing of gorgeous, late afternoon sunshine burst through. This actually added complications as lights and camera settings needed constant adjustment as the sun popped in and out. But we got some keepers. Quickly taking advantage of a few rays of sunshine. Having a laugh between takes. 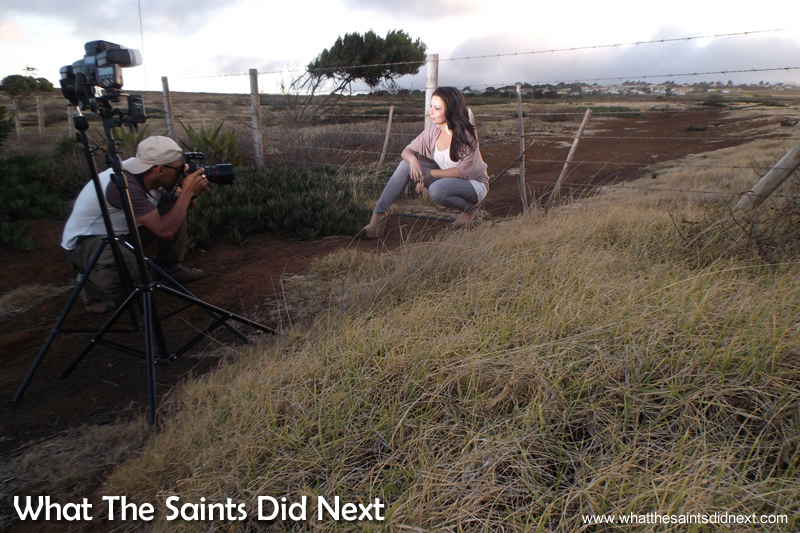 Miss St Helena photoshoot with Sinead Green. Retouching the makeup in the Painter’s Palette. The Painter’s Palette is one of our favourite landscapes on St Helena. A carefully held pashmina preserved Sinead’s modesty as she changed again. Look number four was a cream evening dress with a delicate chiffon train that caught the breeze superbly. And another set of heels for sinking into the red dirt. Out came the sun again. A moment of panic when I realised the 8GB memory card was full and had to sprint off to the nearby camera bag for a replacement. Both girls heckled that I was missing the precious sunshine. To complete our shoot inside the valley we turned 180 degrees, looking up the hill, the sun at Sinead’s back. To overcome the direct sunlight the strobe cluster was moved in to about two meters and cranked up to full power. I wince every time I fire strobes on full power, as if I can feel the life juice being dragged from the batteries. We had to work quickly against the sporadic light; the steep ground was awkward and Sharon kept urging me to shoot faster as the light pockets became shorter. But shooting almost directly into the sun was really confusing the camera’s focusing system and blinding me. It was both frantic and funny. But, once again we got some good shots, before trudging happily up the steep hill back to the car. 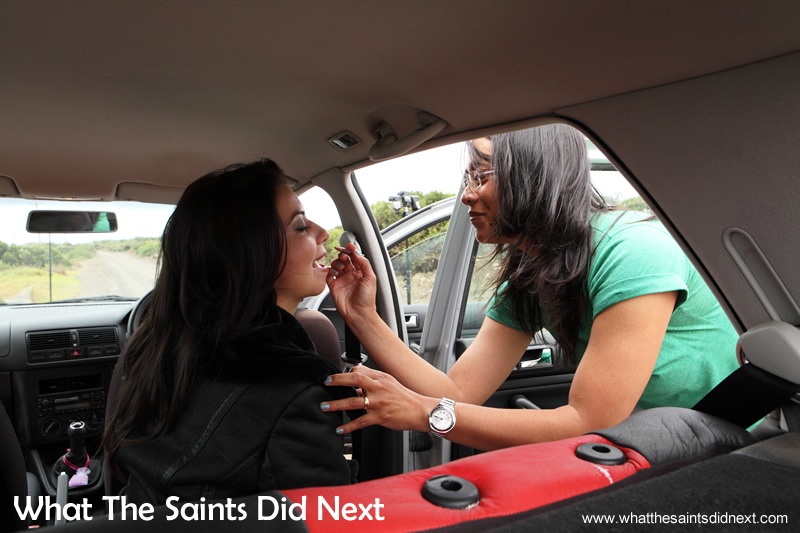 Makeup room, changing room, transportation, storage, shelter… ways to use a car on a shoot. Capturing the final look of the day as the light fades rapidly. The final look was a more casual, jeans and t-shirt style. The sun was now dipping near the horizon where the cloud was more scattered. We composed this final look in front of a barbed wire boundary fence. It was a race against the setting sun. Even though there was only enough time to get in a few shots, they turned out to be pretty good. I was especially pleased with the flash batteries. Each strobe had fired 380 times on the same set of batteries all day. The spares weren’t needed. Photographers love equipment with that kind of performance. Eneloop AA rechargeables; can’t recommend them enough. We decided to see who could do the best model pose to finish the shoot! Sinead finally headed home after more than six hours. We were all tired. Although the weather had been a bit crabby it had been a great afternoon’s work and it felt like we’d laughed the whole way through. Sign of a good shoot. 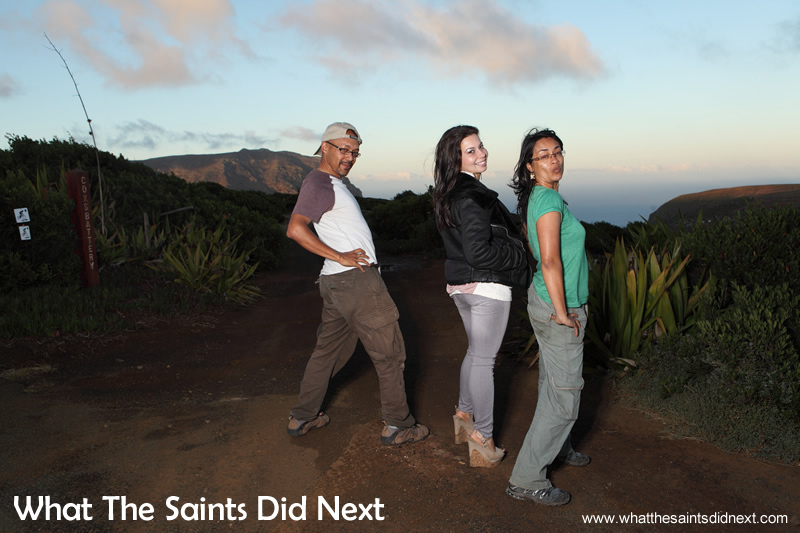 The full Miss St Helena photo shoot and interview appears in the very first Breeze e-magazine. Sign up to the blog by email to get a free download of the latest e-magazine. Breeze e-magazine contains the full shoot and interview – sign up by email to the blog for a free copy of the latest Breeze. Excellent opening paragraph – clever, drew me in. Not sure about Darrin’s posing technique, though.